An Executive Engineer of the State Public Works Department (PWD), NE Council was caught in camera while taking bribe from a sub contractor for releasing contract work Bill. The video captured during the incident was uploaded by the contractor identified as L. Roger from Luwangsangbam Awang Leikai in Imphal West district at social networking site Facebook. Minutes after the video has been uploaded it went viral with many people sharing it. As per the video the Executive Engineer of the PWD, NEC identified as N. Joykumar received a sum of Rs. 1 (One) lakh for releasing the Bill amount. 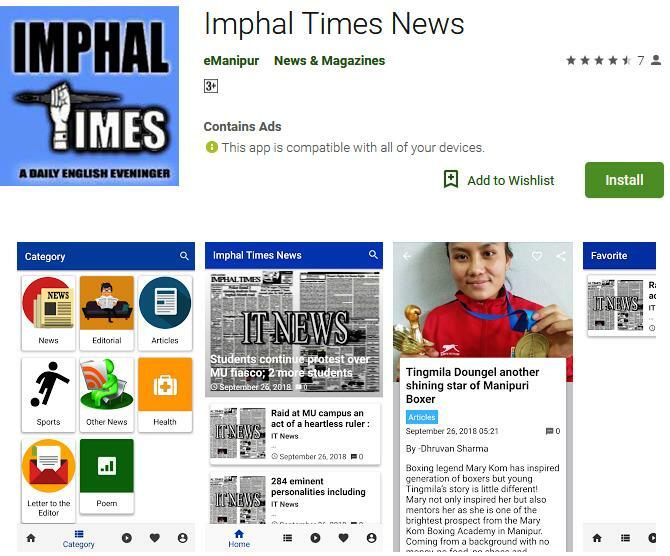 Imphal Times track the contractor who had uploaded the video and finally contact him and interview regarding the matter. The contractor L. Roger while talking to Imphal Times said that he uploaded the video after asking the Anti Corruption Cell. He said he did the contract work for IT road at Tamei under a firm owned by one Special Contractor L. Mani from Thangmeiband. Roger said that the estimated cost of the work is Rs. 6crore 53 lakhs. Almost all the work has been completed except some part due to frequent landslide, but the Bill was withdrawn by the EE N. Joykumar on March 2018 from the North East Council (NEC). On being asked on why he recorded the video and uploaded it at Facebook, Roger said that it was not the first time that the EE has been asking money. Every time the EE took from Rs. 50,000/ to Rs. 2 lakh as bribe for writing bill. He also said that EE Joykumar, asked the money not for him but for others who are superior to him. “Seems like what we are working is for them. They sit in the table and we went to hills and interior part of the state to work and they asked money for writing the Bill”, Roger said. Roger further added that the matter has been complained to the Anti-Corruption cell. Ahead of upcoming 70th Republic Day celebration of India, 43rd Assam Rifles deployed at Moreh conducted Extensive Patrol and Surveillance Operation along Indo-Myanmar International border. Entry of Myanmarese except those who visited India after proper documentation and thorough check at Integrated Check Post were allowed. Illegal entry at Indo-Myanmar Friendship Gates was stopped. The illegal entries at no fence area were also stopped by Personnel of Assam Rifle. Extensive patrol and surveillance operations are conducted at Indo-Myanmar Gate No. 1 , Sunrise Club Ground , Shiva Gate and also at various places of Border Pillar 76 to 79. The Extensive Patrol was conducted by Town Commander of 43 Assam Rifles Major RK. Sharma and ICP Commander Major A. Sharma. The Assam Rifles said the Strict Vigil and extensive patrol were carried out as to prevent from any untowards incident in the town before and during the 70th Republic Day. premier daily. After two years he left Kuala Lumpur for Singapore in 1982 and since then he is living there. Cotton College, Phukan completed his school education in St Edmund’s School, Shillong. Now he keeps busy himself with freelance editing & writings. GPC member-journalists are requested to participate in the program. Graduate teachers Demand Committee for All Manipur primary Teachers/Hindi Primary Teachers- 2001 has submitted memorandum to the Chief Minister of Manipur demanding promotion to Graduate Teachers in respect of the Primary Teachers 91379)/ Hindi Primary Teacher (175) – 2011 who had submitted all the relevant documents for promotion to Graduate Teachers as per the notification issued by N. Praveen Singh former Director of Education (S), on 29th November 2016 as well as final inter se Seniority List also had notified by the present Director of Education (S) Th. Kirankumar Singh on 21st May 2018 for promotion to Graduate Teachers in respect of the Primary Teachers/Hindi Primary Teachers 2011 and for applying/following NCTC Regulation 2014 para no. 1(2), para no. 4(B) and First Schedule para. 6 while absorbing for those teachers who are under Central Sponsorship Teachers (SSA/RMSA). The memorandum drew the attention of the Chief Miniser stating that the Primary Teachers/ Hindi Primary Teachers – 2011 had submitted all the relevant documents for promotion to Graduate Teachers to the Directorate of Education (S), Govt. of Manipur on or before 10th December 2016 as per the notification vide no. AO/156/PPT/2011(6)-DE(S) Vol-i dated 29th November 2016 issued by the former Director of Education (S) N. Praveen Singh as well as a final inter se Seniority List also had notified by the present Director of Education (S) Th. Kirankumar Singh vide no. AO/16/SLP/2009(7)-DE(S)Pt-I dated 21st May 2018 for promotion to Graduate Teachers in respect of Primary Teachers/Hindi Primary Teachers 2011. Quoting a reliable source the memorandum said that that many posts of Graduate Teachers are still lying vacant in the Department of Education(S). Regarding to this matter there are so many more qualified Primary Teachers/Hindi Primary Teachers - 2011 who have completed M.A/ M.Sc/ B.Sc/M.Ed/ B.Ed/ D.EI.Ed. for filling up such vacant graduate posts so as to be able to bring a quality maintained education in our State Manipur. In connection with the matter, the Primary Teachers/Hindi Primary Teachers – 2011 urged the concerned authority of the Education Department for speed up the process of promotion to Graduate Teacher by applying/following the guidelines of the National Council of Teacher Education (NCTE) regulation 2014 para no. 1(2). para no. 4(B) and the first schedule para no. 6 while absorbing for those teachers who are under Central Sponsorship Teachers (SSA/RMSA) as in the State Employees and to take permission from NCTE in order to avoid unwanted circumstances. The memorandum also demanded to speed up the process of promotion to graduate teachers in respect of Primary Teachers/Hindi Primary Teachers – 2011 at the earliest . NPF won by huge margin in the by- election of the 2-Chaton District Council Constituency of Autonomous District Council Tamenlong. The total number of votes where the NPF and the BJP got at the Five designated polling stations are NPF got 227 whereas BJP got 3 votes in Chaton -1 and in Chaton-2 NPF got 302 and the BJP got 10 votes, in Dunong NPF got 575 whereas BJP got 2 votes, at Makuinong NPF registered 685 and the BJP got 4 and at the Illeng NPF got 470 votes whereas BJP got 5 votes. NPF Candidate CPL Guangta got 2259 and the BJP candidate Kadijanbou got only 24 votes. Due to the demise of the NPF Member Tutanbou on 8th April 2018 thus leaving the seat vacant in the Tamenlong District the by-election was held recently on 14th January and which the counting of votes was held yesterday. Manipur’s very own multi-talented and award-winning actress Soma Laishram had her first meet & greet session with her fans in the capital city of New Delhi. During the meet & greet session, fans in Delhi who are also influencers with huge followings on Instagram, Facebook and YouTube came and interacted with the fashion diva from Manipur. Soma is a social media influencer in her own right with close to 200,000 followers on Instagram. With billions of people active on social media, it has become obvious that the influential status of well-known personalities like Soma Laishram from small cities are no longer restricted to a particular region or country but everything is now becoming worldwide. Therefore, actors and celebrities with reasonably huge followership on their social media accounts are today considered as influencers. Soma was greeted warmly by multiple brands, namely - VLCC and Monet Subhiksh who sponsored attendee gifts at the meet-up in recognition of her celebrity status and influential social media presence. The actress also celebrated her birthday with fans and social media influencers at the meet-up which was held in one of the multi-cuisine restaurants serving authentic Manipuri foods in Delhi showing her support and love for food and people of her home state. A boy from Assam was arrested by police for uploading video criticizing the Assam government through social media regarding the Citizenship amendment Bill. A Manipuri Journalist is now detained under NSA for speaking up against the government in Manipur. Earlier many activists including Varavara Rao, Vernon Gonsalves, Arun Ferreira, lawyer-activist Sudha Bharadwaj and civil liberties activist Gautam Navlakha from various part of the country were picked up by Pune police. A student was arrested for calling fascist to BJP instead of warning or guiding her to the right direction, if felt the girl wrong, has proven how desperate is the ruling regime in suppressing the voice of dissent. Kishorechand , a Manipuri Journalist is still detained under NSA. The BJP regime is working all possible way to convert the North East region as a dumping ground of the illegal migrants by passing the Citizenship Amendment Act. Armed Forces Special Power Act (1958) is still enforce empowering the Indian army to commit any action on their wishes. And the National Character of the Erstwhile kingdom is slowly distorted using various technic even by forcing the bhaks connecting the history with the mainland Hindu people. Being Hindu does not meant that we ( the Aryan and the Mongoloid) have same origin). Many Thai follow Hindu religion, Chinese follows Buddhist religion which have its origin in India. How could history of any community be linked just because they follow the same religion. It is worth recalling how an RSS leader boasted of Killing 2000 Muslims in Gujarat to avenge the death of 56 Hindu in Godra during a public speech in March 2, 2017; how another leader people stated that crimes can be controlled by stopping eating “cow meat”; how an MLA stated in public that he will help kidnapping girl during a festival at Maharatra, and how a Religious leader put blame the Karalites of eating beef as the cause of the devastating flood, showed that India is Changing. This is not being stated because these people make a change but because the ruling regime takes no action to any of those people who had spewed venom to communities belonging to different religions. Well coming back to the state of Manipur, the wind that is blowing in the mainland reaches today. The idea of Manipur is seen slowly changing with the idea of fascism. The one time peoples’ friendly Chief Minister now face protest from various sections of the society. Rally, Bandh, general strike and sit-in-protest now become a life of the people due to the various hidden agenda of the BJP to wipe out the indigenous people. Introduction of schemes like go to village, SChools or chief Ministers’ scheme for needy people turns out as another irony to the local self government. The devolution of power to the Panchayati raj or the Autonomous District Council is still a dream and is leaving aside from the priority with the introduction of the new schemes which still is not of that help to the people. The Meitei manuscripts are the resources of almost all the knowledge concerned to the Meitei/Manipuri universe, world and spheres of all the affairs of the public/social and personal (private) individual lives. To the Manipuri’s these manuscripts are the Aryan/Hindu Vedas (knowledge, holy learning or the scriptures of the Hindus) Shastras, etc., which are sources of all the knowledge’s of the Aryans of Hindus. The Manipuri manuscripts, even though a few in numbers having only some thousands are written in various fields of different/varied subjects, topics or disciplines and so these may be classed according to their fields/subjects and the classes can be categorized with regard to their topics/disciplines. To study the scientific knowledge as reflected in Meitei/Manipuri manuscripts, even though it is highly essential will be a tedious work of hardship and cover much space. So some exemplified accounts are set for ready evidence. On Sunday the 21st day of Enga in 1792 Saka, the year of Maisna Deva Sing’s spouse, (corresponding to June 19, 1870 A.D.) the daughter of Naoraoiba Kut (Havildar rank), being impregnated from her elicit connection with the elder son of the Brahmin belonging to the story-telling family died from abortion of her pregnancy by the female abortionist, the family, lineal lady of Konjengbam married to a Brahmin. When dispute arises with regards to the fertilization and development of embryo, the officials of Ametpa Loishang visit and investigate the matter accordingly but they reported that they cannot find it out due to the expiry of the mother, consequently the bone of contention is not valid. Moirangthem man, the servant of the Brahmin in the dispute is rendered to be the person responsible for her demise after the surgical operation find out and proves the truth of her pregnancy with an offspring. From the above fact and finding, it is brought to light that crude surgical therapy had flourished in the 2nd quarter of the 19th century and other therapeutic measures also prevailed in those days. The name and fame of this art and science of Meitei/Manipuri therapy spread far and wide even to the then Ahom country as evidenced by the following record of the said royal chronicle. On Wednesday the 16th day of Shajiphu in 1770 Saka, the year of Yumnaba Khema Singh’s sponcion (1st week of May 1848 A.D.) the Ahom king sent the message to his majesty telling that he has a dreaded disease which many therapeutic practitioners from various countries cannot treat to cure/heal it and requested to sent one medical practitioner as he had heard that there were many skillful therapeutic physicians in Manipur. So his majesty orders to Langoijamba Hema Singh to go to the country of the king of Tekhao (Ahom) to examine and treat the Ahom king to recover his health from his suffering of the disease. Langoijamba Hema Singh examines and treated the disease of the Ahom king for six month and he succeeded in healing the disease of the Ahom king. He arrived at the capital. The remedial techniques and measures taken up in therapeutic art and science consists of psychological treatments, science of pulsation and various modes of feeling the pulses, diagnosis of disease after taking/listening case history and investigation and symptoms of the diseases, exercising in medicinal prescriptions, punctual checking with treatments and timely visits, seeking of the responses of medical treatment in time etc. Dry gall-bladder of python and alum mixed in water are administered orally for the medication of the leprosy disease. In some other manuscripts of Hidaklon or books on medicinal therapy the proportions and doses of medicaments or medicinal floral, faunal or mineral materials items are mentioned. These medical practices had guarded the healths of the Meiteis/Manipuris against the diseases and epidemics in the remote and near post centuries. All the post are to be erected with the timbers of the renown trees growing on the well-known hills, the foundation post will be with the post carved from the timber of the tree growing on Chingthang hills and the post next to the foundation post will be erected with the post carved from the timber of the tree growing on the Wangbren hills. The opposite post of the foundation post will be carved from the timber of the tree called Tumitla (Cinnamonmum Cecidaphne C. Grandiferum etc) or Uningthou (Phoebe Hainsiana, etc. Fan Lauraceae). The rafters and ribs of the roof will be carved from the bamboos growing on the hills of the Thangga and Karang. In addition to these astrological studies, the ‘Lagna’ (Star-track) in the astrological work is an important matter. The word ‘Lagna’ corresponds to the period of each Rashi (Zodiac) lying twelve of them/those in a day. In case of the Meitei/Manipuri, the list of the Lagna is given under the name of Sanskrit, Manipuri and English.